The Scientology Volunteer Ministers Goodwill Tour in Slovakia invites anyone to come in and discover practical tools for tackling life’s problems. Slovakia is a Central European country bordered by Poland, Czech Republic, Austria, Hungary and Ukraine. Nitra, Slovakia’s oldest city, is situated at the foot of the Zobor Mountain in the valley of the river Nitra. This is where the European Volunteer Ministers Goodwill Tour—one of 18 Goodwill Tours traversing six continents—established its distinctive yellow tent. Sponsored by the Church of Scientology, each tour reaches out to provide help wherever and whenever needed by the people of that area. 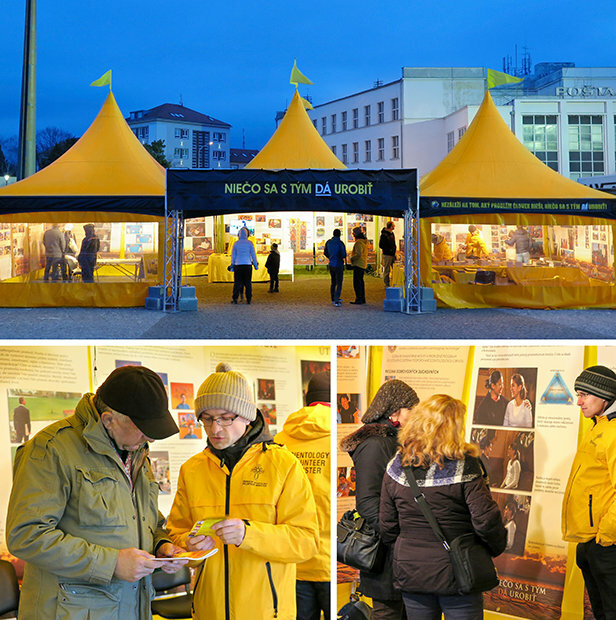 With the Lord Mayor of Nitra’s blessing, the tour set up its yellow tri-peaked tent in the Svätoplukovo Square. VM tents feature panels that provide information on the 19 areas of life that the VM Tools for Life courses cover. These include courses on communication, stress, handling conflicts, marriage, children, work, organizing, ethics and even answers to drugs. After touring the panels a person can then start a free course right then and there in the tent, on whatever subject will address their concerns in life. Material is then available for them to return home with so they can continue to apply it to themselves and with others. Nitra citizens of all faiths, creeds and occupations, and with every type of problem, came into the tent and left with solutions and answers they didn’t have before. There is the lady whose son-in-law was on nine different drugs; she left with the Answers to Drugs booklet. Another woman was having difficulties in her marriage and picked up the Marriage booklet. Yet another did the Children course right there in the tent. Three young students received The Technology of Study course to help improve their success in class. On and on, VMs gave one-on-one attention to every person for their specific need. The VMs also delivered seminars, including one on The Emotional Tone Scale. At The Dynamics of Existence seminar, an attendee shared, “It is great that if something isn’t right in an area of my life, I now know how to fix it.” At another seminar on drugs, an attendee stated, “I am now aware of how drugs can mix up a person’s thoughts and cause them to behave badly, which I have observed of someone in the past.” Another seminar was delivered on How to Resolve Conflicts, with a participant immediately addressing a longtime upset with a former friend. “I now know why a person I once had a good relationship with then started to withdraw from me and why his attitude changed. I can now handle this!” he stated. Nitra citizens of all faiths, creeds and occupations, and with every type of problem, came into the tent and left with solutions and answers they didn’t have before. Further, Scientology assists were delivered to all who requested them, including to the person who came in with back pain that disappeared after a Nerve Assist.